24 August - Sitting in Honolulu Airport . The humidity is nuts. So much for our direct flight from Sydney to Vancouver. Didn't even stay with same plane. Entire reason we chose this route was to avoid US Customs but alas. We have now been fingerprinted, photographed, bags swabbed... All this and have had zero sleep. French speaking steward guy was pretty funny. Must refrain from reading everything out loud that's in French - Toru doesn't seem to appreciate it much :P The really nice lady at departure gate is originally from NZ - explains the really nice part and the comment about certain rules being stupid. Apparently she is from Bay of Islands. Hand luggage was hand searched at Sydney and shoes checked. We were all patted down too. Paid to be standing up at the gate - we got to board before all the people that were sitting. So once we finally make it to Vancouver we get to start the 24th all over again. Yeah so let's not do this again... Oh wait we probably will have to when we return. So more fingerprinting and signing away a waiver to any rights :( I have a real problem with that. 24 August (again) - Flight from Honolulu not so great. More cramped. Apparently they had to find a plane for us so we were probably just lucky to get out of Honolulu. Customs etc. was easier than transit in US. Easier doesn't even describe it. Thank god though, I was ready to topple over from exhaustion, lack of food etc. So yes we made it. Walked for awhile around Downtown/Granville St. Found Rocky Mountain Choc shop but didn't buy anything (yet!). Robson St looked cool but I don't think I'd be willing to pay the prices. Toru's sleeping (I think) and I'm bored. It's odd that it's still so light outside, so used to it being winter in NZ. Well we have roommates now. They're British. I found a cool beach/park thingy. 25 August - Made it to free breakfast then walked to Granville Island via Granville Bridge. 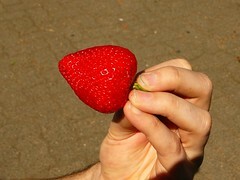 One word about Granville Island - STRAWBERRIES!!! Okay so in general, food. Best strawberries I've ever had, and I've had a lot. Got some blueberries too. Should've got blackberries but going back for them tomorrow. Got donuts. Soooo good. 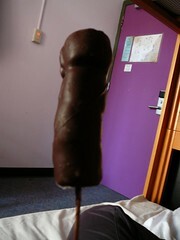 Don't know that you can get donuts in NZ that are anywhere near these. Mmmmm... We then headed to Broadway (east/west?) so Toru could go to MEC. Got bus to Burnaby where there was a rather large mall, Metrotown. Not so much of interest to me but yeah. Oh that's right, got a really cool hat in Granville Island. Got SkyTrain back from Burnaby, pretty cool. Auckland should seriously invest in those. While outside MEC a lady asked us for directions (which we could actually give) and surprisingly she picked our accent. She's visiting friends in NZ soon, small world. Just been lazy and sitting around the hostel tonight. Watched the final of Whistler. HA HA HA. Vancouver is very clean. There are recycling bins everywhere - awesome. (So far) Canadian's as a whole are very friendly. Got pitcher of beer on Davie (gay central apparently). The cheese sticks were nothing like cheesy bread, remember not to buy on rest of trip. Have new roommates now but haven't seen much of them. 27 August - Got ferry to Victoria. Have a car for a few days. So drove to Victoria then walked around. Very pretty but seems very touristy. Maybe that's just me. Drove out to some lighthouse. Got in for free. Saw random animals wondering around carpark. Some American's were stranded, their rental car wouldn't start. Gave them ride back to Victoria. They had some really nice strawberries. Hostel is very funky/artistic, to put it one way. But cheap and has its own bar :) We have tiny, tiny room (cos we're that cheap) that fits a foldout bed and fridge. Nothing else. Had more beer. 28 August - Well today had to be the best so far, besides the incredibly crappy sleep. Drove from Victoria to Tofino, which is approx. 4.5 hours. Driving around looked like NZ, if you exclude the tall, tall trees and the smooth, flat, straight roads. Went kayaking in Tofino which was awesome. Sun was out but was a bit windy hence slightly choppy water. Serious currents in some spots. In a double kayak, with rudder which I am really not used to. We kayaked out to part of Meares Island were there's a short walk thru forest. Saw HUUUUGE trees and really old trees (one was approx. 1800 years old). 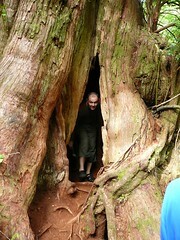 Some had hollowed inside so you could stand in them. Drove to Nanaimo since I insisted on staying here. Definitely worth it, it's probably the ritz compared to the rest of our trip - Painted Turtle Guesthouse. It's supposedly a hostel but I would liken it to a hotel. We get an awesome queen size bed in a fairly decent sized room and free internet. Finally a decent sleep tonight. 31 August - K, so I was lazy and bored so didn't write the last few days. Nanaimo was pretty boring but the hostel was great. So many places there are closed on Monday's and Tuesday's. Very strange. 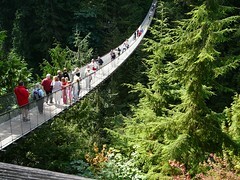 We got ferry back to Vancouver and went to Capilano Suspension Bridge. I'm just insanely paranoid, well paranoid isn't the right word. I trusted the bridge but the rocking etc. still freaked me out. Anyway, so we walked around Old Strathcona and had coffee (well Toru did). Internet is very expensive here - what's the deal? I thought Vancouver was bad but it's cheap in comparison. $1CAD for 15mins! Tomorrow we are going to the infamous West Edmonton Mall for the most part of the day. - Why do they call Rock Melon Cantalope? Especially when they still call Honey Dew Melon, Honey Dew. - Why do we call green peppers capsicum? - In my opinion, the average NZ'er likes very plain, bland pizza (with the exception of anyone who gets Hell Pizza) but the Americans/Canadians (in general) like extremely plain pizzas. Why? I remember at RBNZ, whenever American's called they wanted a pepperoni pizza which we didn't have but created in a roundabout way. Yet here it is the norm. I can't remember what else... You get the drift. We had Pizza Hut tonight. Was very disappointed. The entire reason to get Pizza Hut was so I could say I'd had pizza like on tv :P But alas, our rather plain pizza looked exactly like one from NZ. And the cheesy breadstix weren't stuffed with mozerella, they just had light cheese sprinkles on top. We brought OJ with 'lots of pulp'. Ahhh the freedom of choice - no pulp, some pulp, or lots of pulp. Mmmm pulp. My head hurts. Oh yeah, Babylon was playing in the cafe. Yay for Dave. 1 September - Spent most of today at West Edmonton Mall. Still not a lot of Maree-shopping. I guess it doesn't matter what country I'm in... Here there are way more stores, therefore even more I'm not interested in. I started my DVD buying today but behaved. It was like browsing Amazon.com but in person. Ahhh the selection. Lost is out in a few days (S2) but will have to wait till we fly back to Vancouver as won't be anywhere with HMV. Toru mentioned curry today and ever since I've wanted curry. How can a country this size not have Indian food? So we had to have Subway for dinner due to lack of interesting places nearby. Toru's moved the mattress to the floor to reduce noise. The second you move a muscle on that bed it makes an incredible amount of noise. So the floor it is. There's some farmers market tomorrow, so will head to that before driving to Jasper. 6 September - On plane about to leave Calgary. Pretty empty plane. After LL drove to Banff. Spent the morning looking at all the sights then had a pint on rooftop of Rose and Crown. Hostel was nice but waaaay too hot and stuffy. Didn't sleep much so was pretty grumpy the next day. That is until we found the only DVD store in Banff which had Lost Season 2 (released that morning) and at a standard price. YAY! Walked around the town for awhile before going back to the hostel so Toru could have coffee with his old boss. Banff hostel has a cafe and bar. Had breakfast at cafe and beers night before in the "Storm Cellar". Played lots of pool too. We had the longest wait at the airport for bags. Then the longest bus ride back to the hostel. Went to Granville Island (again) for lunch and donuts and berries. Went to the brewery there as well for a pint. Finally found some nicer beer there. Still not as good as Tripel. 7 & 8 September - Uhh trying to remember this as didn't write anything. Did a HUGE walk on the 7th. Walked to Gastown and saw the cool steam clock, then walked onto Chinatown. Then walked across Granville Bridge to South Granville. Pretty tired after that. Had a quiet day on the 8th. Went to Granville Island again (on the cute little ferry) for lunch and good coffee/hot chocolate and more berries :P Went to Chapters to get a book for the flight (which I didn't get around to reading cos I felt like crap) which then gave me a voucher for Roots so I went and got the top I'd been looking at and looking at but didn't want to spend that much on. Realised I could get tax back as well so it's all good. Flight back was again long and I got barely any sleep again. The movies all sucked and I had a headache so couldn't really do much. We had to clear US customs in Canada this time. Toru got a nice lady who asked nothing but I got interrogated and told off for not pressing hard enough on the fingerprint machine.